Pharmacy Symposium at Belmont University in Nashville, Tennessee, February 1, 2019. Belmont University’s College of Pharmacy hosted the Third Annual Middle Tennessee Antimicrobial Stewardship Symposium this morning in the Janet Ayers Conference Room on Belmont’s campus. The event was planned and hosted by Dr. Montgomery Green, associate professor of pharmacy practice, Dr. Erin Behnen, associate dean for assessment and academic affairs, Laura Hyde, continuing education coordinator and Dr. Shaefer Spires, assistant professor with Vanderbilt University School of Medicine. 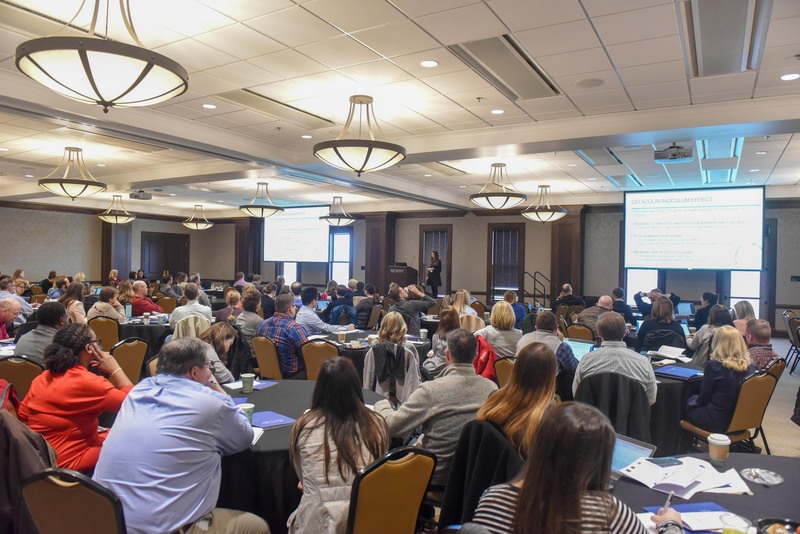 The symposium was attended by more than 125 healthcare professionals from multiple disciplines including pharmacists, physicians, nurses and those involved with infection prevention and patient safety and quality from 7 states and more than 50 healthcare facilities. Several alumni, preceptors and Belmont faculty were in attendance, as well. Attendees came from all over the state of Tennessee, and beyond! Morning sessions featured a lineup of experts in antimicrobial stewardship. These included Christopher Evans, PharmD, BCPS, HAI pharmacist, Tennessee Department of Health Healthcare Associated Infections and Antimicrobial Resistance Program; Whitney Nesbitt, PharmD, BCPS, BCIDP, antimicrobial stewardship pharmacist, Vanderbilt University Medical Center; Kristi Kuper, PharmD, BCPS, senior clinical manager, ID at Vizient, Inc. and Elizabeth Dodds Ashley, PharmD, MHS, FCCP, BCPS(AQ-ID), Duke Antimicrobial Stewardship Outreach Network (DASON). The morning’s keynote speaker was CAPT Arjun Srinivasan, MD, associate director, Division of Healthcare Quality Promotion, Centers for Disease Control and Prevention, who gave an update on national activities regarding antimicrobial stewardship. During the afternoon, participants attended workshop sessions led by pharmacists, physicians and laboratory personnel, allowing them the opportunity to discuss topics in a small group format. Topics included antimicrobial stewardship (AS) programs in long-term care facilities and emergency departments, procalcitonin, AS practices in the NICU, national reporting and joint commission requirements. This symposium brought together key stakeholders and practitioners to learn about these topics and discuss ways to work together as a medical community to improve appropriate antimicrobial use and mitigate risks. The 4th Annual Symposium is scheduled for January 31, 2020.